Most of us have heard the old saying, "the squeaky wheel gets the grease." Well, there's a reason for that. A squeaky wheel suggest something could be wrong. Your garage door is no different. When something is wrong you'll more than likely notice. A noisy garage door is a clear symptom. It is certainly a good idea to take a closer look at your door and see if you can stop a small noisy issue from becoming a serious and very expensive problem. The first and most obvious reason your garage door is "singing out of tune" may simply be because it hasn't been lubricated in a while. Once you've visually inspected your door you can get your little oil can (or adequate lubricating product) and apply a little bit of it to the springs and other moving parts of your door. Now go back and open and close your door a couple of times. If it sounds normal again, you've more than likely solved the problem. Apart from needing a bit of lubrication, some of the other causes of a noisy door can be problems with the opener's motor, a screw or bolt that have become loose, or an accumulation of dust and/or debris in the tracks. One of the bigger problems you may encounter is that your garage door springs have gotten too damaged and need to be replaced. It's not always a good idea to play the role of a DIY handyman. Some of your system's moving parts, the springs in particular, can cause significant physical harm or property damage if handled incorrectly. This would be one job you definitely want to call the experts for. Unfortunately, your garage door can't last forever, and after years of wear and tear, a noisy door may simply mean it's time for replacement. Even if your old door still has some life left in it, replacing it with a new and improved model is the most efficient and economical strategy to pursue. It'll actually save you money in the long run. 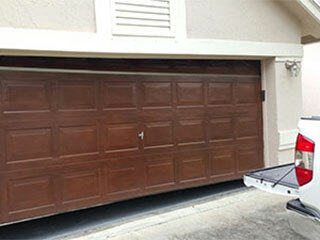 On a final note, while you may be confident enough to take care of some of these problems on your own, leave any major maintenance and repairs to our experts at Garage Door Repair Pompano Beach. We can take care of all your problems in no time.